SUNNYVALE, CA--(Marketwire - November 25, 2008) - On Cyber Monday, the first big online shopping day of the season, TeleNav will offer a one-day only service discount on its recently launched TeleNav Shotgun two-way, Internet-connected GPS personal navigation device (PND). Customers who purchase a TeleNav Shotgun on Cyber Monday, December 1, and use Cyber Monday coupon code 'sgcybermonday' (case sensitive) will automatically receive six free months of TeleNav Connected Service -- three more than they would normally receive if they purchase the TeleNav Shotgun on another date or without using the Cyber Monday coupon code. Cyber Monday deals are often a good way to stock up on gifts for the holidays while also avoiding the long lines and crowded stores usually experienced on Black Friday. TeleNav Shotgun makes a perfect gift for business travelers because it leverages the wireless network to provide real-time, connected information such as traffic alerts, Internet content (maps and business listings) and updated gas prices. Whether it's for a family member, for a friend or as a corporate gift, TeleNav Shotgun is a unique GPS device that can be used to help avoid the traffic headaches of a daily commute as well as help travelers navigate around new cities and business locations. TeleNav Shotgun is available for purchase on TeleNav's Web site at www.telenav.com/shotgun or by calling TeleNav at 1 88 TeleNav 8 (1.888.353.6288). Through TeleNav Connected Service(SM), TeleNav Shotgun monitors traffic conditions along drivers' routes in major areas and proactively searches for congestion or incidents. Customers will be alerted to traffic delays, both audibly and on-screen, and can choose an alternative route to their location with one touch. Users can also access specific incident information and determine the traffic speed / flow of major highways along their route. TeleNav Shotgun even displays an updated estimated time of arrival (ETA) based on traffic, speeds and distance. TeleNav Connected Service also keeps content (maps and local search data) up-to-date so users do not have to separately download new information. TeleNav Shotgun comes with 11 million points of interest (POIs), one of the largest databases of business listings available on a PND. Categories are easy to search and include a variety of locations, including restaurants, hotels, airports, Wi-Fi hot spots and regular gas price updates. Users can also type in the name of a specific business. Business listings include phone numbers, saving money on 411 charges if they need to call ahead. Users can also preplan trips, save addresses and manage accounts online at www.telenav.com. Customers can save locations in their 'My Favorites' folder, which will be automatically downloaded on their device the next time it is turned on. Additionally, the new My TeleNav Internet browser plug-in for Internet Explorer®, Firefox® and Google® toolbars provides users an easy way to send addresses to their TeleNav Shotgun from any Web page. Users can simply highlight an address and click the TeleNav button on their toolbar. The address will be automatically added to My TeleNav for later use on the TeleNav Shotgun. Online access means that administrative assistants can help preplan business trips for the people they support as well. With the TeleNav Connected Service, TeleNav Shotgun users can take advantage of upgrades without having to purchase a new device (1). Updates will be delivered via the wireless network, so users don't have to deal with the hassle of connecting cables and downloading software on a PC. TeleNav Shotgun is available for $299. On Cyber Monday, December 1, new customers will also receive six months of free TeleNav Connected Service if they use Cyber Monday coupon code 'sgcybermonday' (case sensitive). Device owners not wishing to subscribe to TeleNav Connected Service following the six-month free period included with their purchase on Cyber Monday will be able to use the TeleNav Shotgun for GPS-enabled turn-by-turn navigation but will not have access to connected features such as real-time traffic and online preplanning. Editor's note: TeleNav Shotgun images, b-roll and a fact sheet are available for download at: http://www.telenav.com/about/pr-shotgun/. TeleNav's solutions include GPS navigation, Mobile Resource Management (MRM), social networking and local search. 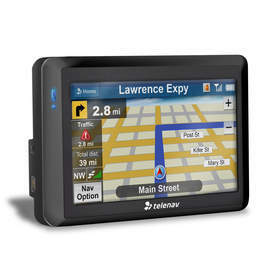 The company's flagship service, TeleNav GPS Navigator™, offers functionalities comparable to in-car systems and standalone navigation devices, such as automatically-updated maps and business locations, full-color 3D moving maps, traffic alerts with one-click rerouting, location-sharing, business reviews, speech recognition, Wi-Fi hotspot finder, gas price finder and more. TeleNav also delivers its award-winning navigation service on the TeleNav Shotgun™, a standalone GPS personal navigation device (PND) tailored specifically for business travelers. TeleNav's enterprise application, TeleNav Track™, incorporates GPS-enabled tracking, time sheets, wireless forms and navigation. TeleNav Track is a widely adopted service with over 9,000 customer organizations using it today. TeleNav services are available on more than 450 wireless devices and run on most major mobile platforms currently available. TeleNav's partners include Sprint Nextel, AT&T, T-Mobile USA, Alltel, Boost Mobile, SouthernLINC Wireless, Rogers, Bell Mobility, T-Mobile UK, T-Mobile Austria, China Mobile, Vivo Brazil, Telcel, NII Holdings, Research In Motion (RIM), Motorola, Samsung, Sanyo, LG, Palm, HTC, Hewlett-Packard, Nokia, NAVTEQ, Tele Atlas, deCarta, INRIX and Qualcomm. "TeleNav," "TeleNav Shotgun," the TeleNav logo, and "telenav.com" are registered and unregistered trademarks and/or service marks of TeleNav, Inc. Unless otherwise noted, all other trademarks, service marks, and logos used in this press release are the trademarks, service marks or logos of their respective owners. (1) New features may be packaged and sold differently and may require additional fees. Details will be available when new features are released.